Ria's starting to settle into country life herself; until she has a close encounter of the terrifying kind with a buffalo. Turns out the peeping monster belongs to the cowboy next door; and he has her running even more scared than his bison. She wants a home where the buffalo don't roam, and the men don't either. Could Landry's homecoming be her heart's undoing? Linda Lael Miller is quickly becoming one of my go to authors for comfort reads. 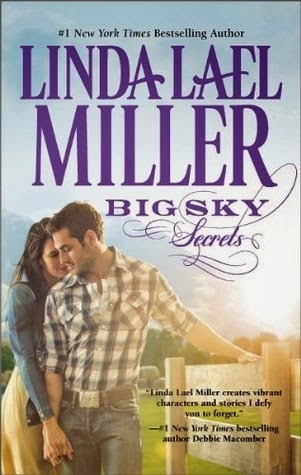 Big Sky Secrets was a really lovely read. It was my first time with the series and a little different than I was expecting but it was fun, sweet and heart warming read as Ria and Landry have a battle of wills and start embracing their new lives in this little Montana town and maybe each other as well. I really liked both Ria and Landry. They're just good people that are kind of at a cross roads in their lives. It was fun watching them in their daily lives--Ria working on her flower farm and going to the farmers market, Landry butting heads with his British butler (they were so stinking cute together) and making a go of being a cowboy. Seeing them with their families and just watching their slight enemies to friends to lovers relationship change and grow. It was a good time all around. He loved it when she seethed. It was proof that her blood ran hot, a distinct advantage in bed. Provided they ever got to bed, that was. What I really enjoyed was that Big Sky Secrets was a nice combo of sweet, funny and a little heart breaking too. I really felt for these two. Chuckled over some things like rogue flower-killing-run-away pet Buffalo and misted up over Ria working through the loss of her husband and troubled marriage and deciding to risk love again. It just all came together nicely for a great read. Miller had me falling right along with Ria and Landry and really has me wanting to go back and read the rest of the series and see how all of the couple found love in this small Montana town. Have you read Lina Lael Miller? Have a favorite? Do you have a favorite enemies to lovers story? Or cowboy?